tujacan some1 update this hud https://www.dropbox.com/s/vqo62fxtweom7x6/HUD_oldbroesel_YaHUD_I_THINK.rar?dl=0 ? I'm having trouble finding the following items, if someone could tell me what file they are located in, I'd be very grateful. The player icon panels used for MvM, the ones that show if you're ready or not. Also for some reason, some of my item effect meters, which are centered on the screen, like to shift to the right 50 or so units every now and then. Any idea on why this happens? MysticalKaitlynI'm having trouble finding the following items, if someone could tell me what file they are located in, I'd be very grateful. [quote=MysticalKaitlyn]I'm having trouble finding the following items, if someone could tell me what file they are located in, I'd be very grateful. MysticalKaitlynThe player icon panels used for MvM, the ones that show if you're ready or not. the path is ..\resource\ui\hudtournament.res, controlled by playerpanels_kv. It likely uses if_mvm for certain elements that are only controlled in MvM. the path is [b]..\resource\ui\hudtournament.res[/b], controlled by [b]playerpanels_kv[/b]. It likely uses [b]if_mvm[/b] for certain elements that are only controlled in MvM. There is a way to make less space between buff\debuff icons? xXx_n00b_D3stR0y3r_xXxThere is a way to make less space between buff\debuff icons? I'm curious how you got all those status icons visible, did you use a bunch of addconds? I have a suspicion the offsets is relative to how wide your HudPlayerHealth parent element is, change the width to not be the full screen and see if the icons get closer together. [quote=xXx_n00b_D3stR0y3r_xXx]There is a way to make less space between buff\debuff icons? I have a suspicion the offsets is relative to how wide your [i]HudPlayerHealth[/i] parent element is, change the width to not be the full screen and see if the icons get closer together. Go to hudmediccharge.res, and change "visible" and "enabled" to 0 for "ChargeMeter" and "ChargeMeter1-4". Edit: I'd recommend moving it, rather than removing it entirely. As a Medic main, I don't like it if people make their Medic useless. [i]Edit:[/i] I'd recommend moving it, rather than removing it entirely. As a Medic main, I don't like it if people make their Medic useless. My killchat(right top corner) just dissepeared for some reasons, what is the command or what file to edit to enable it? Does anyone know how to change the ammo in clip to white and ammo in reserve to a cyan-y blue? I can't find any RGB colour number thingys to change. fiestaMy killchat(right top corner) just dissepeared for some reasons, what is the command or what file to edit to enable it? Check if you have hud_deathnotice_time set to 0 (default is 6 i think) if its not then something is wrong with the hud files. The killfeed is HudLayout > HudDeathNotice if you wanna try edit it. boltekDoes anyone know how to change the ammo in clip to white and ammo in reserve to a cyan-y blue? I can't find any RGB colour number thingys to change. HudAmmoWeapons.res and change the "fgcolor" of "AmmoInClip" and "AmmoInReserve". 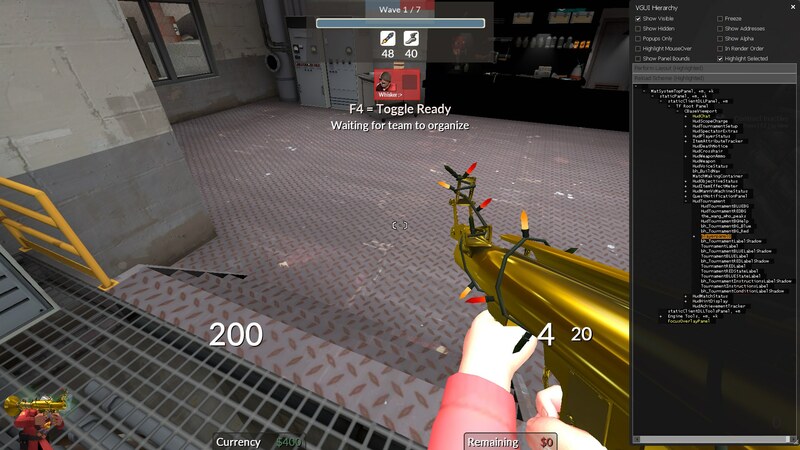 If you don't have a "fgcolor" line just add one, also you might need to change the colors inside the hudaminations_tf (hudanimations_custom is some cases) for the end of the low ammo animation as well! 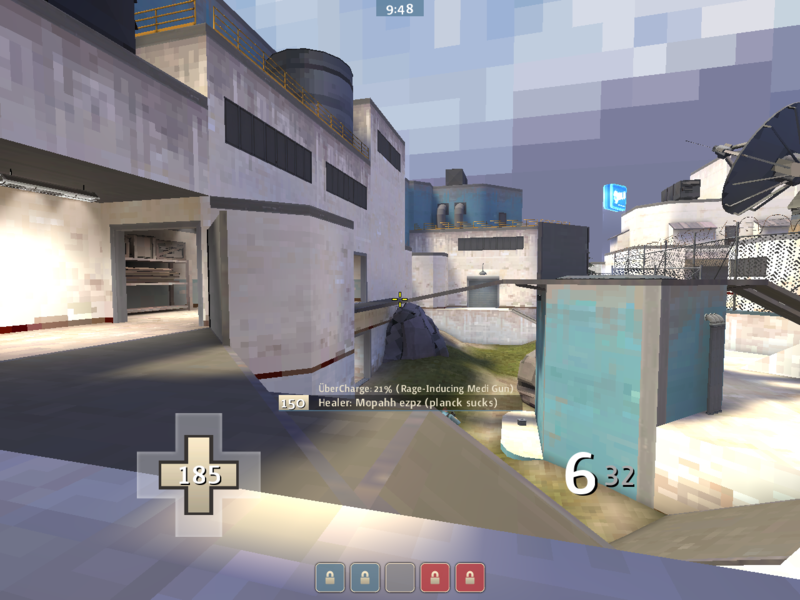 Get the font file and put it in the HUD, define and name it in the clientscheme, change the ammo/health fonts in hudammoweapons.res and hudplayerhealth.res to whatever you have it named as, and change the fgcolors to 255 0 127 255 for hot pink. I've changed hud fonts in the past but Hypotize hud uses this #base thing and i have no idea how it works and I can't seem to change the fonts like how I did in the past. I just want Roboto for damage numbers and surface for health/ammo, which both come with the hud afaik - what should I do to change these fonts? nuzeI've changed hud fonts in the past but Hypotize hud uses this #base thing and i have no idea how it works and I can't seem to change the fonts like how I did in the past. I just want Roboto for damage numbers and surface for health/ammo, which both come with the hud afaik - what should I do to change these fonts? - then open resource/scheme/Fonts_Game_Surface and look for GameFont22Shadow and for the name instead of "surface-medium" you will change it to "Roboto Bold"
Where exactly is the air strike counter? worked a charm ty sir! i'm using the Hypnotize hud, it's all good but i dont like the timer being on the top left of the screen, what should i change to move it to the center ? How do i change the text colour for ubercharge percentage? Thanks in advance. The field is TargetDataLabel in targetid.res. It doesn't look like you can change the colour of just the ubercharge though, as the whole field is one variable. HudMatchStatus.res > "ObjectiveStatusTimePanel" > "xpos" "c-25"
Valve hardcoded this color sometime ago and now the only way to change it is by changing the "TanLight" color inside the clientscheme.res but be aware that tanlight changes every white-ish text in the hud pretty much. I would say it is only worth changing it if you want it to be completely white (same as the ammo in clip for example). Attempted updating an old hud, whenever I was about to deal damage my game would freeze for a split second and then come back. Switching back to my prior hud and it wasn't an issue. Anybody know what from the hud could be causing it? edit: found out that if you have something animated under event DamagePlayer and the thing being animated just straight up doesnt exist it freezes the game. idk why it was there. Jahud does it. While you can't actually use a center alignment (as far as I'm aware), you can just add whitespace to the start of the caption so that it's functionally centered. If you use a different font, you'll have to redo the closecaption_english.txt and compile it. But if you're a fan of product sans then you could use the one directly inside jahud. [url=https://github.com/JarateKing/jahud-tf2]Jahud[/url] does it. While you can't actually use a center alignment (as far as I'm aware), you can just add whitespace to the start of the caption so that it's functionally centered.